A documentary about the First World War with images never before seen to commemorate the centenary of the end of the war. 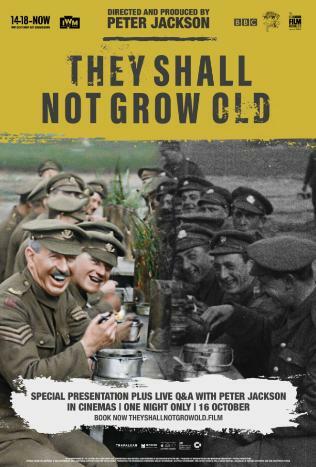 They Shall Not Grow Old is a British documentary film of 2018 directed and co-produced by Peter Jackson. The film was created with original World War I images from the archives of the Imperial War Museums, most of them never seen before, along with the audio of the BBC and IWM interviews to the British military who fought in the conflict. Most of the images have been colored and transformed with modern production techniques, with the addition of sound and voice effects that act to be more evocative and feel closer to the real experiences of the soldiers. It is Jackson’s first documentary as a director, although he directed the faux documentary Forgotten Silver in 1995 and produced the documentary West Memphis Three West of Memphis in 2012. Jackson, whose grandfather fought in the war, intended the film to be an immersive experience of ” what it was like to be a soldier “instead of a story or a recount of events; The team reviewed 600 hours of interviews of 200 veterans and 100 hours of images from the original film to make the film. The title was inspired by the line “They will not grow old, since we are getting older” from the 1914 poem “For the fallen” by Laurence Binyon, famous for its use in the Ode of memory. They Shall Not Grow Old premiered simultaneously at the BFI London Film Festival and selected theaters in the United Kingdom on October 16, 2018, before being broadcast on BBC Two on November 11, 2018 (Armistice centenary of November 11, 1918 ). He was acclaimed by critics for his restoration work, immersive atmosphere and representation of the war. The film was co-commissioned by 14-18 NOW and Imperial War Museums in association with the BBC, who approached Jackson in 2015 for the project.According to Jackson, the crew of They Shall Not Grow Old reviewed 600 hours of interviews from the BBC and the IWM, and 100 hours of original film footage from the IWM to make the film. The interviews came from 200 veterans, with the audio from 120 of them being used in the film. After receiving the footage, Jackson decided that the movie would not feature traditional narration, and that would only be the audio excerpts of the soldiers talking about their war memories, in order to make the film about the soldiers themselves; for the same reason, it barely features any dates or named locations. The music was composed by the New Zealand Plan 9 trio, consisting of David Donaldson, Steve Roche and Janet Roddick. The final credits of the film show an extended version of the song “Mademoiselle from Armentières”, which was particularly popular during the war. The film premiered on October 16, 2018 as a special presentation at the BFI London Film Festival, in the presence of Prince William, Duke of Cambridge, and premiered at several selected theaters across the country; Copies were also sent to schools in the United Kingdom on the same day. The film was screened simultaneously in 2D and 3D in cinemas, schools and special places throughout the United Kingdom. The simulcast included a question and answer session with Jackson, presented by film critic Mark Kermode. The film was aired on BBC Two on November 11, 2018, the Armistice centenary of November 11, 1918. To accompany the film, a special episode of the documentary series What do artists do all day? that followed Peter Jackson making the film aired the following day on BBC Four. The film received a limited release in the United States through Fathom Events in 2D and 3D, on December 13 and 27, 2018.